If you’ve been thinking of trying out a new social network, you’re not alone. 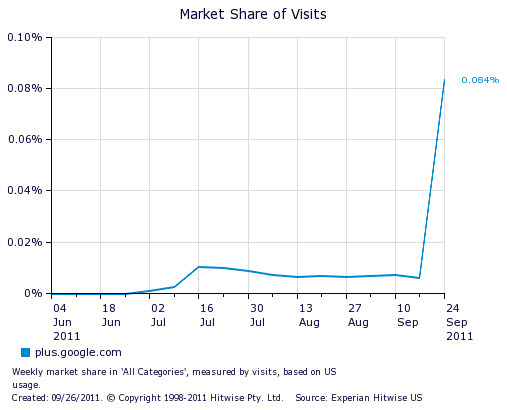 Google Plus has seen a sharp rise in traffic over the past week according to new data from Experian Hitwise. Last week, right before the F8 conference, Google Plus was made open to the public and introduced a number of new features including stuff for Hangouts, Google Docs and some added search functions. Since then, Google’s star social networking service has seen a traffic surge of 1269 percent, with U.S. visits at 15 million—significantly trumping the paltry 1.1 million U.S. visits from the preceding week. That data doesn’t even take into account mobile users, or those that wander over to Plus using the black bar. It’s not exactly clear what caused the spike, though its possible to draw a correlation from the drop of the invite feature or criticism over Facebook changes. Whatever the reason, Plus doesn’t seem to be going the way of Orkut anytime soon. Currently, Hitwise is ranking Plus at number 8 in the Social Networking and Forums category, just behind MySpace and way up from its former spot at 54. ReadWriteWeb also points out that Paul Allen’s estimates have the Google Plus user count now at 43 million. Further chipping at the rivalry with Facebook, CityVille, Zynga’s most popular game on Facebook has recently come to Google’s social networking site. Cityville currently has 72 million users. Google also rolled out an interesting change for one of Plus’ main features, Circles. Similar to Twitter lists, now Google Plus users will be able to share separate circles of friends with others. A share link will pop on the Google+ Circles page, which will allow you to share with your friends. The new feature doesn’t allow others to see the title of the circle or if the circle creator updates members.